During this week’s “Understanding the MYP” PTO workshops we have had a chance to discuss the skills which our students will need to be successful in the 21st century. The presentations can now be found in the files section of the IB parents association groups’ files section on Managebac within the “Other documents” folder. In his book, “Most Likely to Succeed: Preparing our kids in the innovation era” Tony Wagner identifies the skills our students will need to be successful in the 21st century. 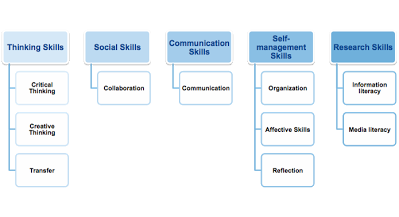 These skills reassuringly align with the approaches to learning skills which we explicitly teach here AISB (and shown in the diagram below). Mastering any of these skill sets will have a positive impact across a number of subjects and so should certainly be a focus for the personal growth of all students. To support this growth, at present specifically for the grade 9 students, an AISB Approaches to Learning website has been constructed. It has been built to provide tools which students can use to independently develop these skills and will continue to grow in response to the needs of our students. By all means take a look – http://atlskills.aisb.ro/. This entry was posted by neilcommons on October 20, 2016 at 11:13 pm, and is filed under Uncategorized. Follow any responses to this post through RSS 2.0. You can leave a response or trackback from your own site.